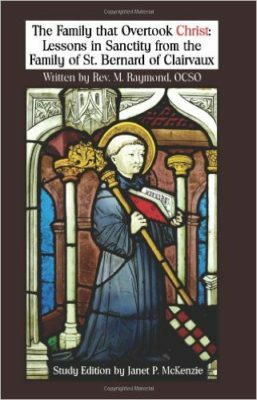 This is a beautiful inspiring classic that was recently republished about the incredible family of St. Bernard of Clairvaux, France. All of St. Bernard’s siblings have been canonized as blessed by the church, five brothers and his only sister Humbeline. His brothers were Guy, Gerard, Andrew, Bartholomew and Nivard. His mother was Blessed Alice and his father was Venerable Tescelin. St. Bernard also had a sister-in-law who became Blessed Elizabeth as well as his niece, Blessed Adeline. You will be inspired and filled with wonderment and awe as you read each chapter about the family and their call to holiness that each accepted and pursued. The king of that time became very jealous as St. Bernard inspired many of the young aspiring knights to change course and join St. Bernard’s monastery! This is a book that every Catholic family should have in their treasure chest of great Catholic books. It is a wonderful book to read aloud different chapters every night with the family, especially during times of Advent and Lent. All will be enthralled and amazed at this incredible story of one family’s call to holiness that effected history. Excellent reading!